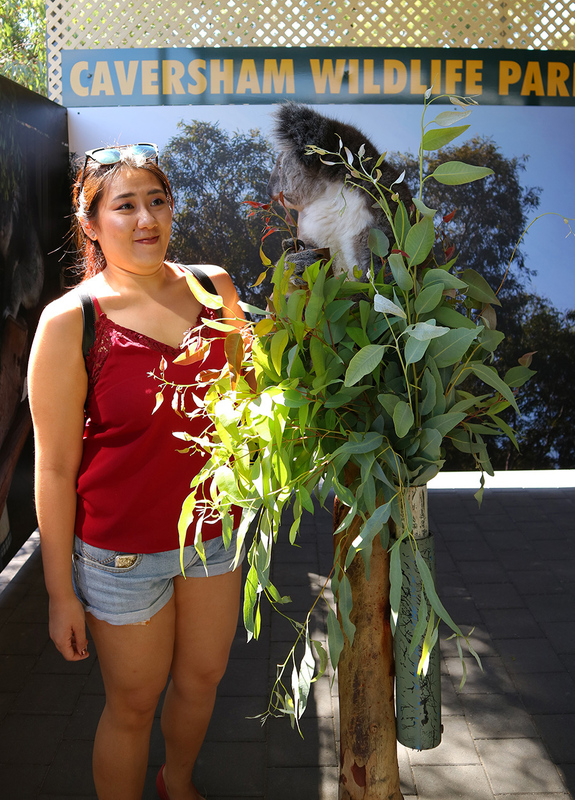 This image above clearly shows that I have no idea how to react when a Koala looks me in the eye. And yes, that double chin scares me too. It has been about 2 weeks since I've returned from Australia and it was a little tough to settle back into the daily grind, not gonna lie (but then again, when is it ever easy? A holiday is a holiday!). This was the first time I explored a new city by myself (if I do not count my student exchange experience in Rotterdam) and while I was lucky enough to stay with my friend, I spent quite a bit of time on my own and I learnt quite a few things about this beautiful city and myself. 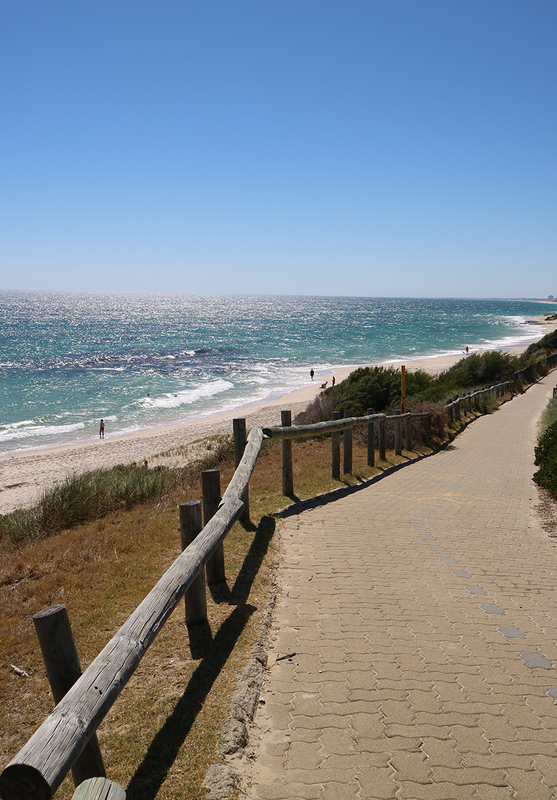 Perth was beautiful and I am amazed by how blue the sky is and how many stars I could see in the sky at night. It was so beautiful and sometimes just looking up gave me a sense of joy and peace. That may be a weird thing to say, but fun fact, Singapore experiences quite a bit of light pollution (yes, there's such a thing and according to The New Paper, we are the most light polluted country in the world) and thus, the sky at night especially isn't as clear and thus the lack of stars. 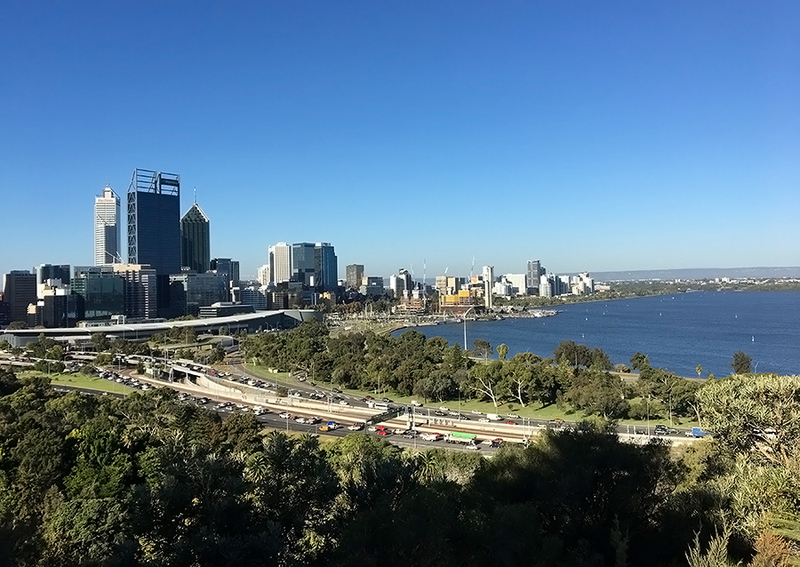 Perth also had tons of land and nature and it is the complete opposite to our man made urban landscape that is Singapore. Less crowds there also made me more patient. I have this thing with crowds.. and that's probably why I'd rather stay at home alone in my little space. Regardless, I had a whale of time and I thought I would share with you some of my experiences here. Before I flew over, I tried to google search "Exploring Perth without a car" or "Getting around Perth with Public Transport" and I could not find much. Even the vlogs and blogs that I've read for research involves road trips and this can be slightly despairing if you're travelling alone and renting a car to drive long distances may not be at the top of your list. So can you get around Perth without renting a car? Yes... and no. I know, that answer clearly confuses you even more but it ultimately depends on where you want to go. Perth has trains which are quick and efficient (for example, Perth city to Fremantle took about 20-25 minutes I believe). The trains do cover many places but you would probably have to walk quite a bit or transfer to a bus for some areas. I was staying with my friend when I was there and my journey to the city involved taking bus ride for about 40 minutes before I could reach a train station and then taking the train down. That being said, buses there are impressively timely, and you can refer to the bus timetable (just google transperth and the bus number!) to see when the next bus will arrive! Perth city felt more familiar to me, due to the tall buildings and people rushing around. I did not spend too much time there but on my way to finding the bus stop to take to King's Park, I stumbled upon a Salvation Army Thrift Store and I managed to score a brand new Big Magic by Elizabeth Gilbert for AUD 3.45! The nerd in me could not stop doing a victory dance. After my amazing find, I did check out King's Park and the Botanic Gardens! There, if you can see a lovely view of the city as well! 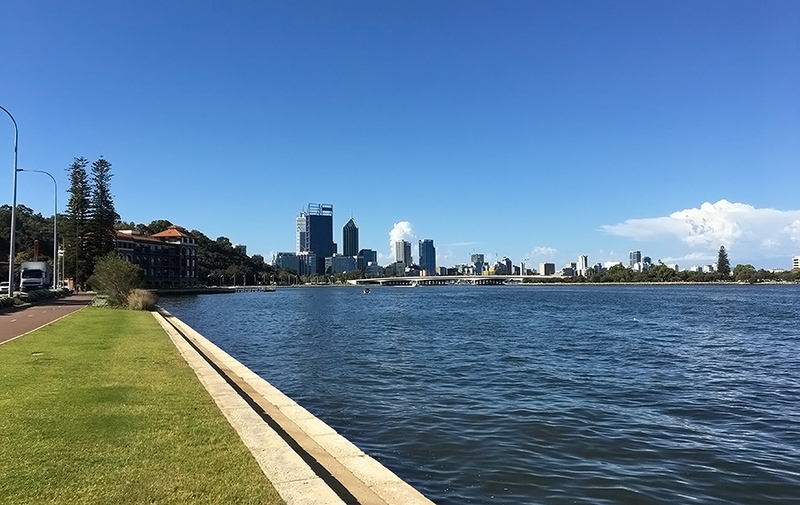 You can also check out the Lottery Federation Walkway too and see the gorgeous view of Swan River. Fremantle is definitely a place to check out. It had a really laid back vibe and I do recommend checking out the Fremantle Markets if you can. The market is only open on certain days so be sure to do your research before hand. So many food options! 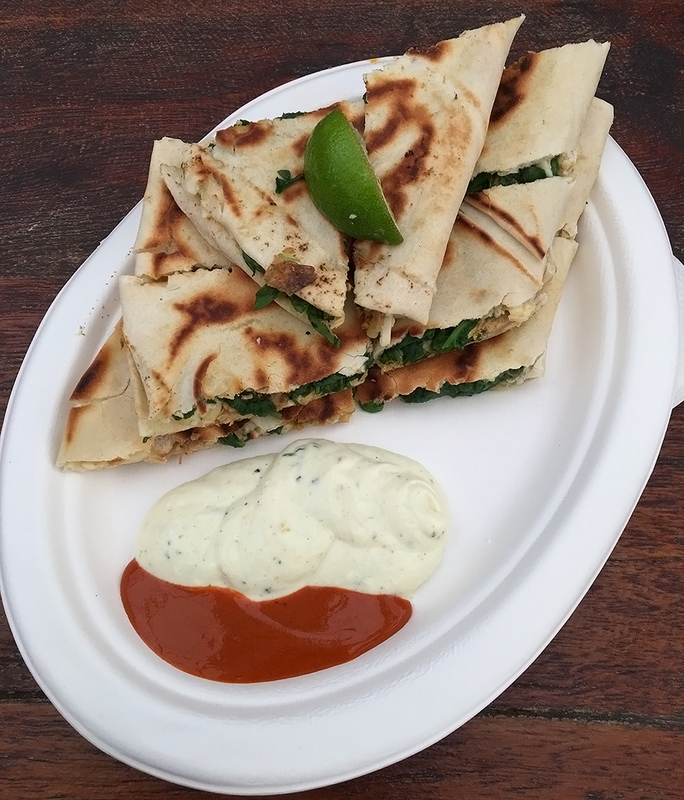 I got myself a chicken, feta and spinach flatbread from Freo Gozleme and it was delicious. Portion is a tad big if you're an average eater so sharing this would be ideal. As for me, I ate it all and then went back for a doughnut from Levi's Doughnuts which was right beside it. 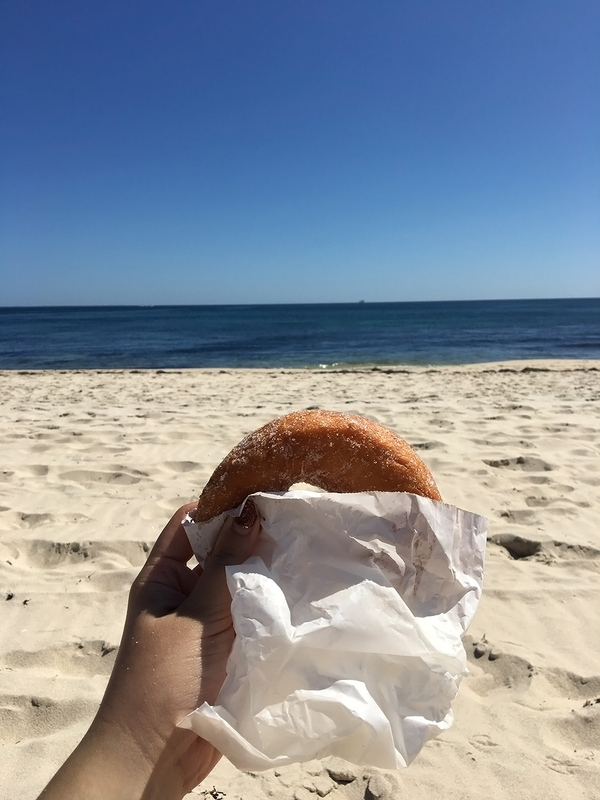 Good ol' doughnut that made my heart sing (and I ate it at the beach mentioned below). At Fremantle, there are quite a few crystal shops as well if you're into that (I got myself quite a few!) and there is also the B-shed Ferry Terminal where you can take a ferry to Rottnest Island which I'll mention about later. 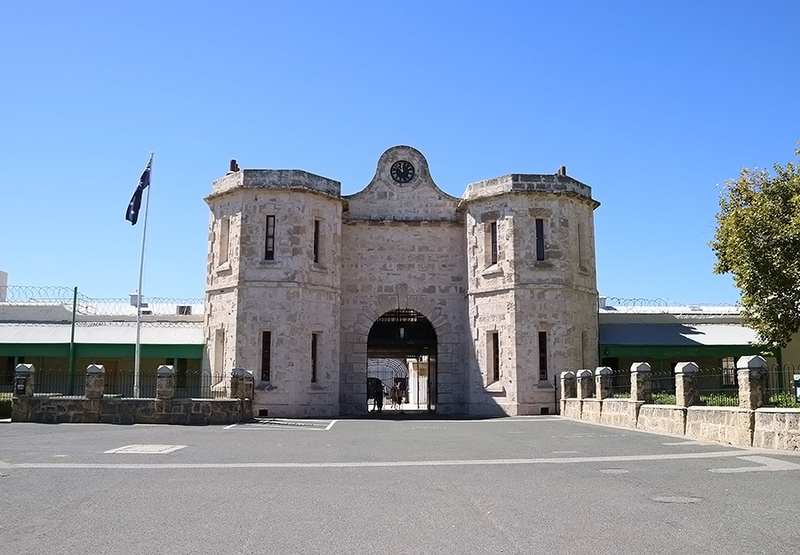 Lastly, there is also the Fremantle Prison where you can take a tunnel tour which shows you how life was like in the prison back then. I wished I went for one but I ran out of time. I believe that the tour was AUD 21 (can't really remember!). If you are planning to visit Cottlesloe beach, which I highly recommend that you do as it was truly lovely, you can drop at Cottlesloe train station and walk about 8 minutes towards the beach. My goodness, the water was so clear and glistening under the sun. I didn't want to leave, but my sunburnt chest and forehead told me it was time. This was one of the most beautiful beaches I have ever been to and boy, did it hurt a little to leave. I still think about the blue waters now! 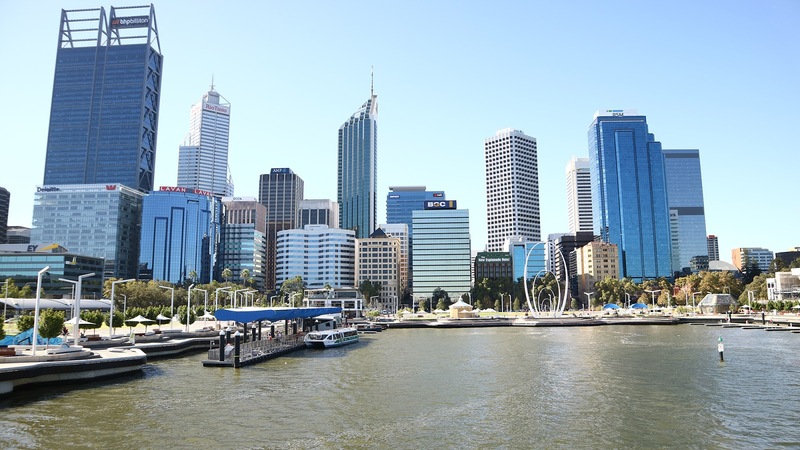 There, you can simply take a bus 102 towards the city (it ends at Elizabeth Quay). On this bus, you will also pass by the famous Blue Boat House (aka Perth Crawley Edge Boatshed) if you are interested in dropping by. I have to admit, this boat house was pretty much in the middle of nowhere and slightly underwhelming amidst all the hype. Regardless, it was pretty cool and if you're up for it, you can walk along the Swan River towards the Elizabeth Quay after. That took me about 55 minutes and I highly advise against doing so in flip-flops (but what can I say? You learn from your mistakes!). 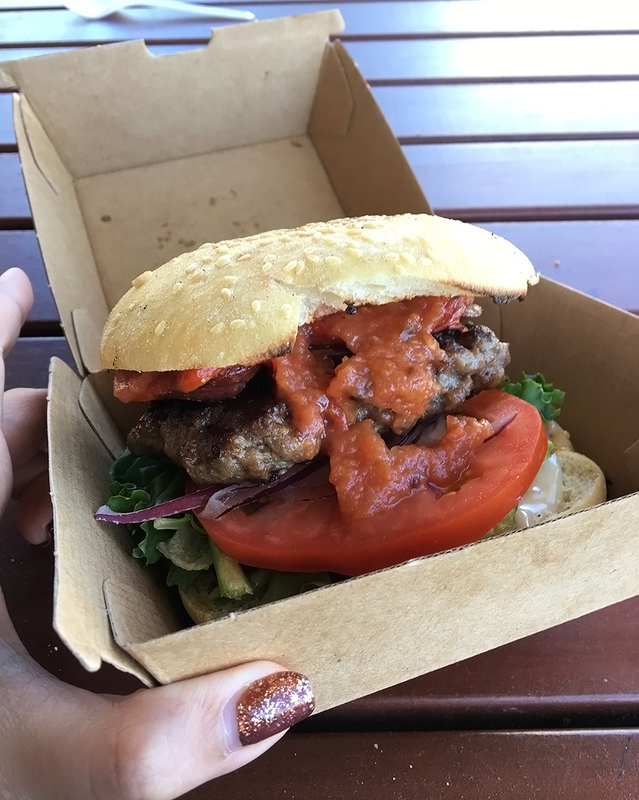 Since you will end up at Elizabeth Quay, you can check out V Burger if you're hungry! You probably deserve it after all that walking, or if you're smarter than I was and took the public bus instead. I had their Pepperizo burger and it was delish! You can also walk across the Elizabeth Quay bridge and see The Bell Tower / Swan Bells. It was honestly extremely underwhelming for me, so much so that I did not take a picture. However, the view on the bridge is a great way to take in the skyline of the tall buildings in the city. If you're taking the train, a little FYI, also on the blue line is Claremont. From what I saw on the train, there is a pretty big shopping complex there with a David Jones. If you're up for a little treating yourself and some aircon, this could be a stop to consider! 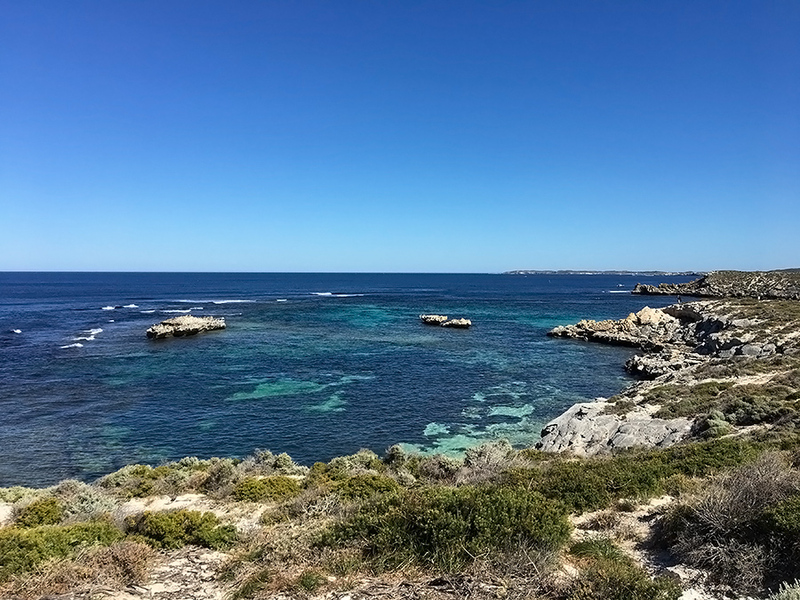 Rottnest Island was a lovely experience as well. I took the ferry from Fremantle's B Shed and it took about 45 minutes. Once there, you can rent a bike to explore the island (I believe it was AUD 30) or get a ticket for a hop on hop off bus (AUD 20) which I did. Rottnest Island was larger than I've expected and if you're short on time like I was, or just riding up steep slopes seem pretty challenging, I'd recommend the bus. The bus drivers will provide handy information as they drive from stop to stop as well. Do note that the buses are usually 30 minutes apart and due to that, you may be unable to get on it if you're trying to get on at a popular stop (my bus was full ever since west end and people from all the other stops after could not get on! This isn't good if you have a ferry to catch). That being said, let's talk about the main reason to go there. Quokkas! I somehow expected them to just be wandering around and considering all the selfies I saw online, I thought it would be quite easy to spot them. That does depend quite a bit on luck if you can spot them or take a selfie with them as people tend to crowd around whenever one pops up. 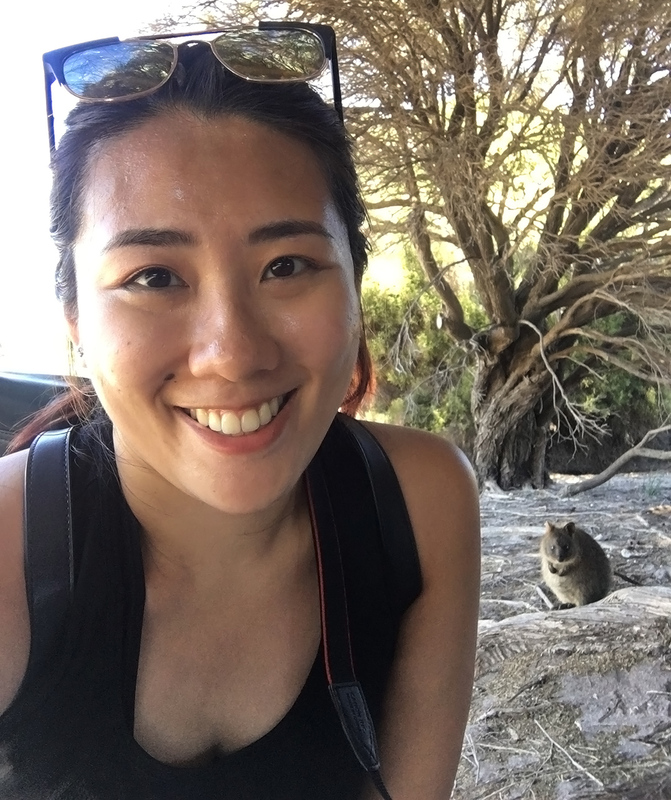 I only managed to see quokkas when I left the main settlement and headed to less populated areas. 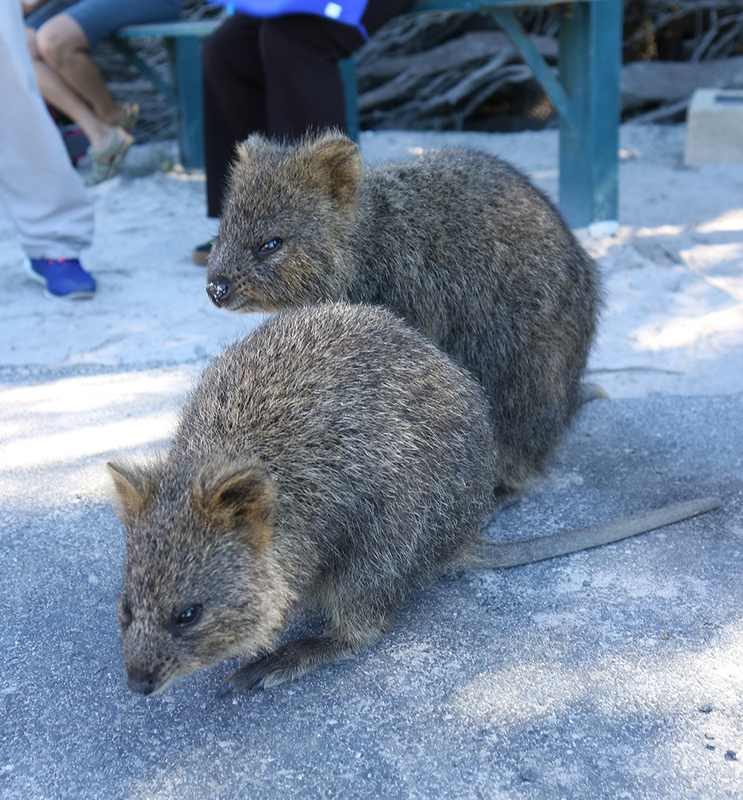 I went on a free walking tour (there are quite a few at certain timings around the island) and the lady told us that Quokkas love cool and dark areas, so look for them under the trees and bushes! 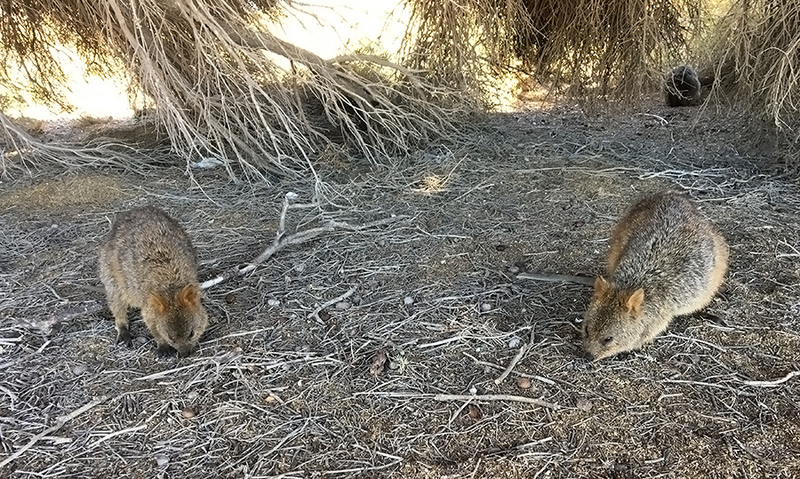 On my way to Wadjemup Lighthouse, I managed to catch three quokkas under the trees! And since there wasn't anyone else and I got lucky, I tried my utmost best to take a selfie. Don't laugh, I tried my best! 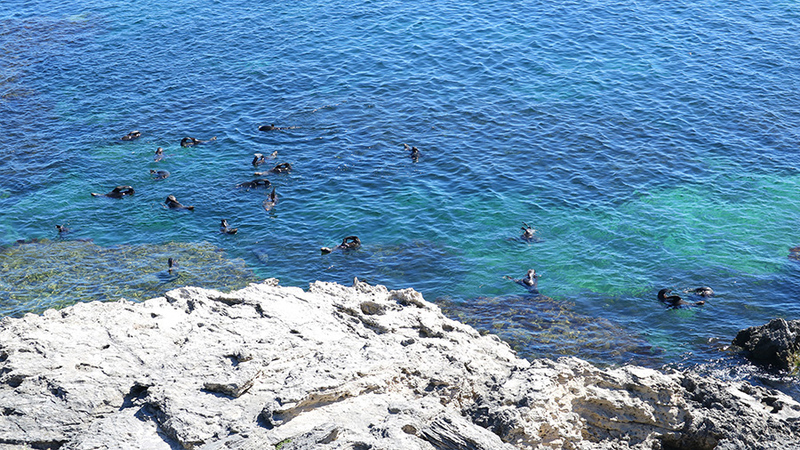 I also recommend heading to Cathedral Rocks (West End Stop for the bus) to see the seals! I was so fascinated by them just chilling in the water, so much so that I fell as I could not peel my eyes off. How dumb! I did not manage to take a picture of it but there was a quokka on the deck looking at the seals as well! Overall, I had 5 hours on the island and did not explore half of it. Thus, I do recommend spending more time there to see more! Also, check out the Rottnest Bakery; Their aroma of their freshly baked pies attracted me from afar and I was not disappointed. 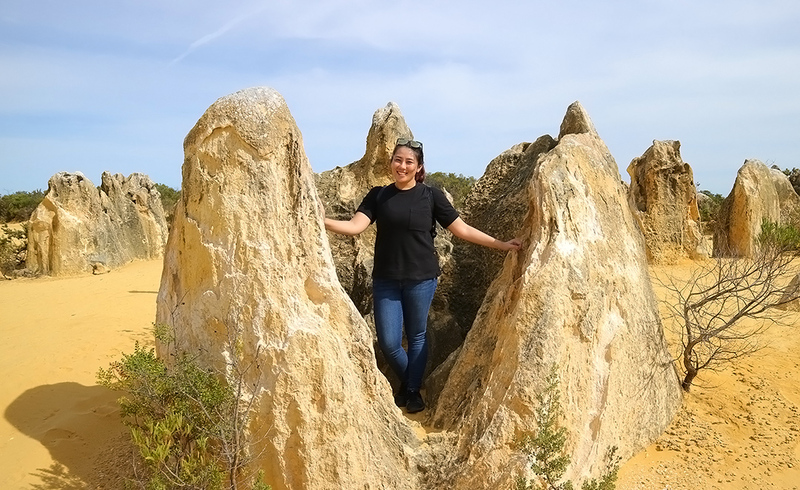 To get to the Lancelin Sand Dunes and the Nambung National Park, I booked a tour (this one! I highly recommend it!). This is especially useful if you need transport to and fro. My guide was extremely friendly and I thoroughly enjoyed the day. 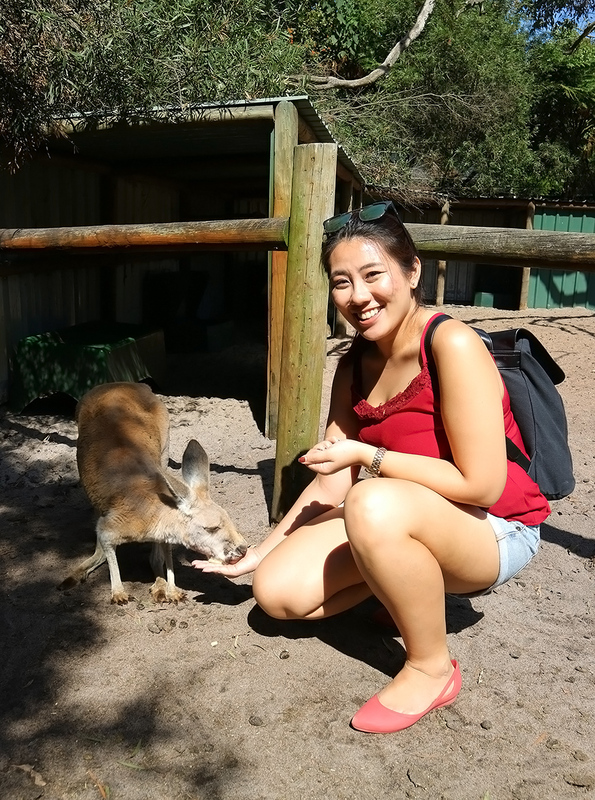 My tour started off at Yanchep National Park where I got to see some kangaroos, koalas and cockatoos! You will also learn a little more about the aboriginals and their culture there. 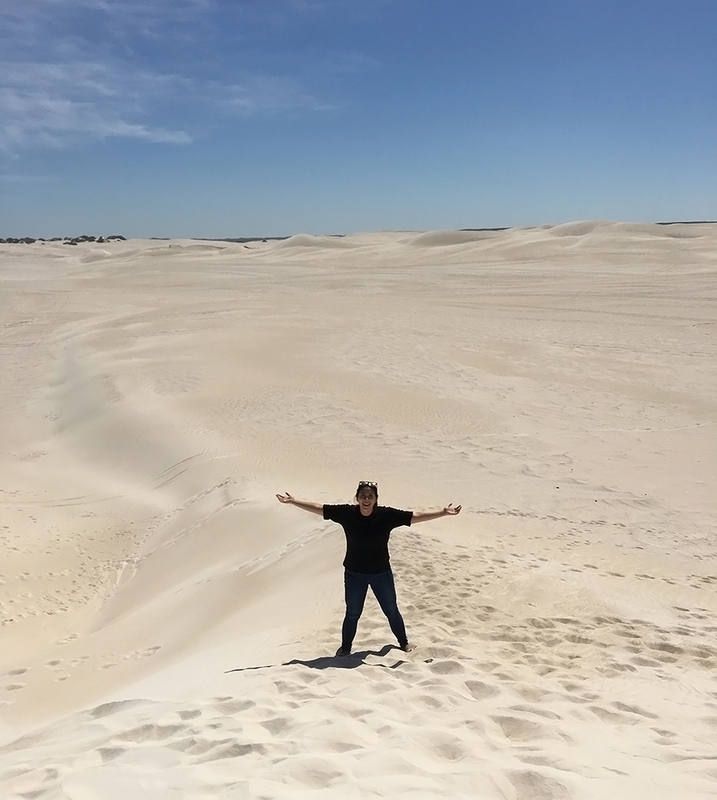 Then, it was about a 45 minutes drive to the Lancelin Sand Dunes where you can try out sandboarding! I was so fascinated as I've never seen sand dunes before. Was it wise to wear jeans, you ask? I honestly don't know. It was extremely hot but hey, at least I had no pesky sand bits in my delicate areas if you know what I mean. Despite the blazing sun, the sand was cool and since they were extremely fine, they did not hurt one bit. Fun fact, the sand is white as apparently these are made from crushed shells! Warning, climbing up is a work out. My thighs cried for help. 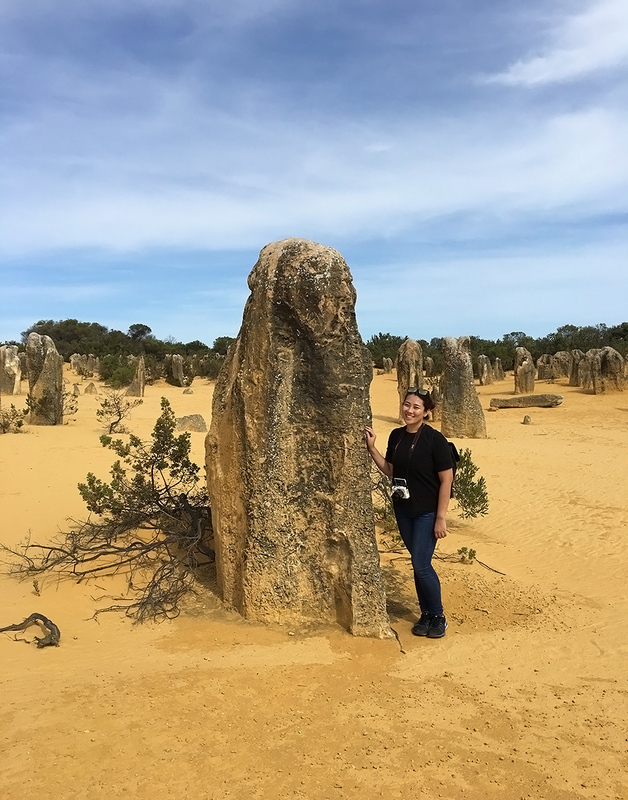 The pinnacles at Nambung National Park is a must-see as well. It is extremely unique and while I thought it was similar to the Stonehenge in the UK where there is just an area with the formations, this was certainly not. 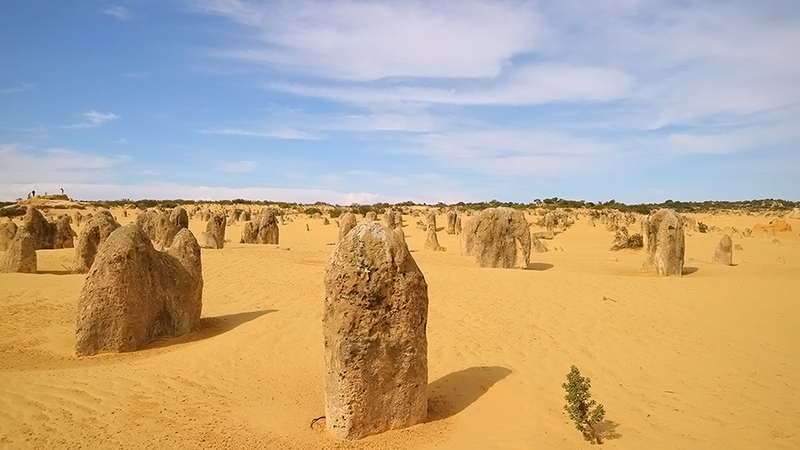 It is a desert full of these limestone formations and it stretched out as far as the eye could see. Do go see it for yourself when you're there; It's truly something magical. 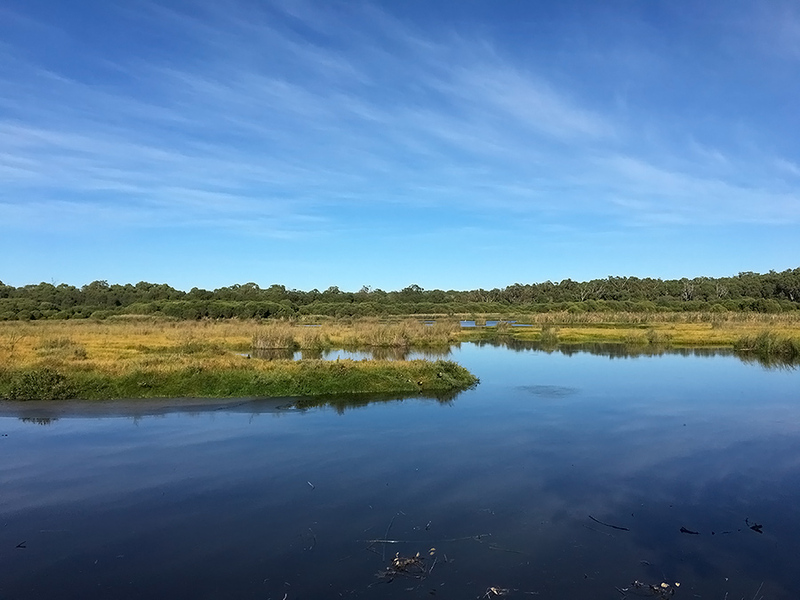 Lastly, I went to visit Caversham Wildlife Park and Swan Valley! I was very lucky that my friend and her husband showed me around as these areas are honestly difficult to get to without a car! 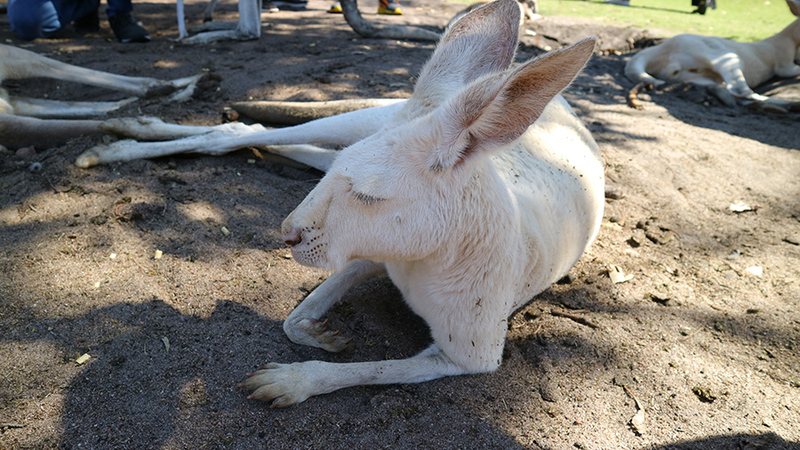 Caversham Wildlife Park was a truly hands on experience and it is definitely a more eye opening experience than a zoo. I got to feed kangaroos! And milk a cow (my goodness was I excited and I am insistent on showing you the picture of me pulling on the udder of the cow). 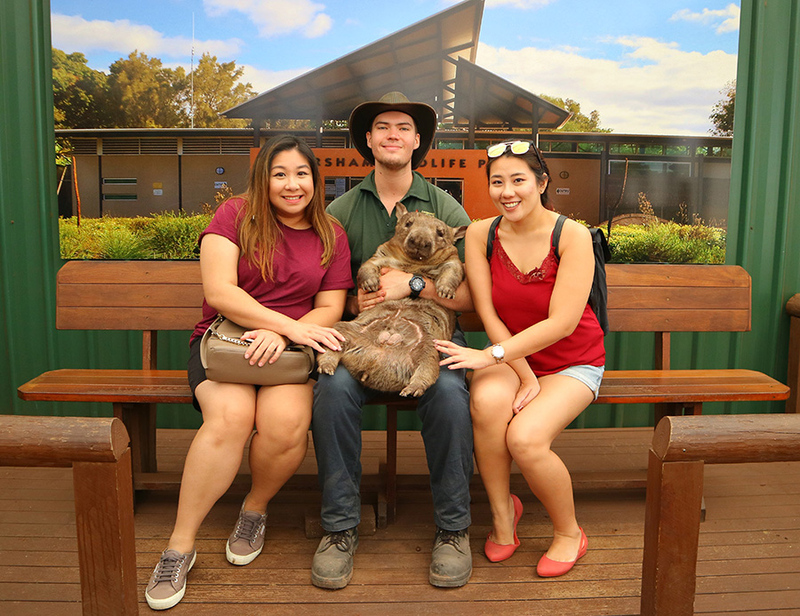 Here, you can also take pictures with wombats, koalas and a snake too if you're interested. I've never seen an albino kangaroo before so this kinda blew my mind. 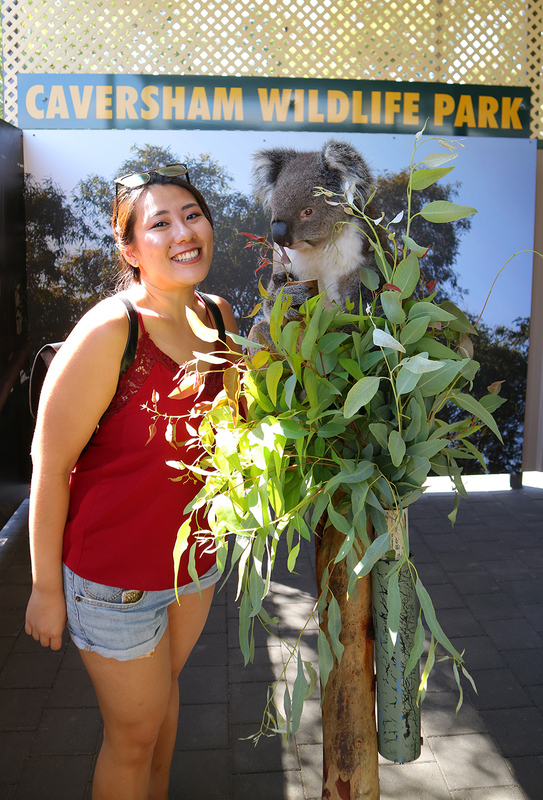 Also, the very first image of the koala and I was taken in Caversham too! Here's one where I try to act like a decent and socialised human being with an adorable animal. Swan valley was once again larger than I've imagined (I somewhat imagined it to be a straight road down where I can walk from store to store. This city girl obviously doesn't understand the concept of land space)! There were shops selling wine, cheese, chocolate and much more. I highly recommend heading to The House of Honey! You can taste all their different types of honey there and my goodness, I fell in love with their Lavender Honey. So good. Just urgh, so goooooood. That's about it for my Perth experience! The last time I visited Australia was 20 years ago so this was definitely new and exciting. The people there were really friendly and the slower pace of life was definitely welcomed. How I wish Singapore could slow down a tad! Funny story, yesterday I was at a volunteer orientation and I met a lady who lived in Tokyo for 15 years. 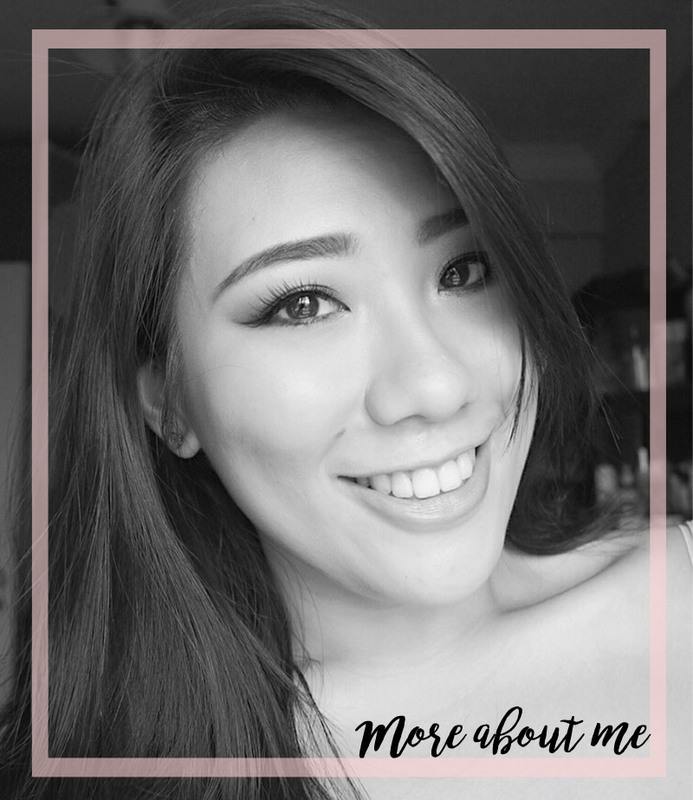 She said she enjoyed Singapore but she finds the pace of life here pretty slow. I was flabbergasted but that just reminded me how the grass always seems greener on the other side! 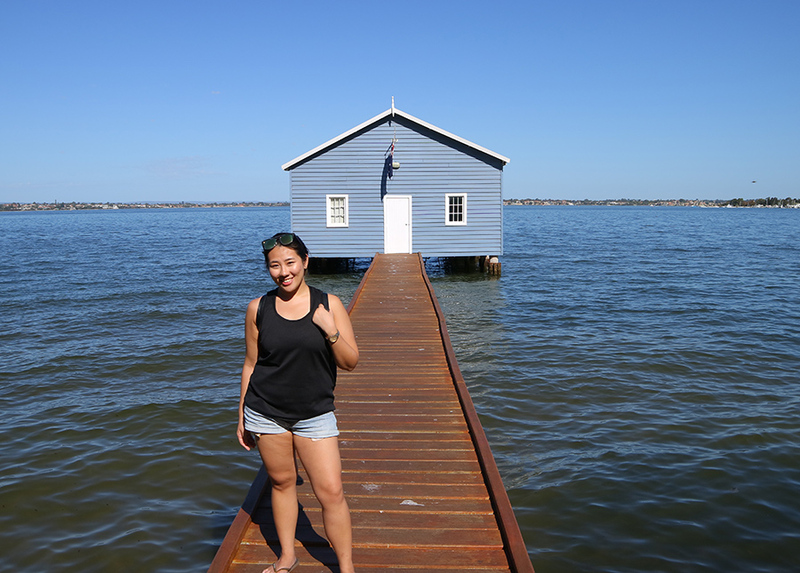 Hopefully this post was useful, especially if you're planning a solo trip to Perth soon!